I will never buy pickled ginger in a jar again, it’s so easy to do it at home and tastes tenfold better than even the snazziest most expensive organic market ginger in a jar. 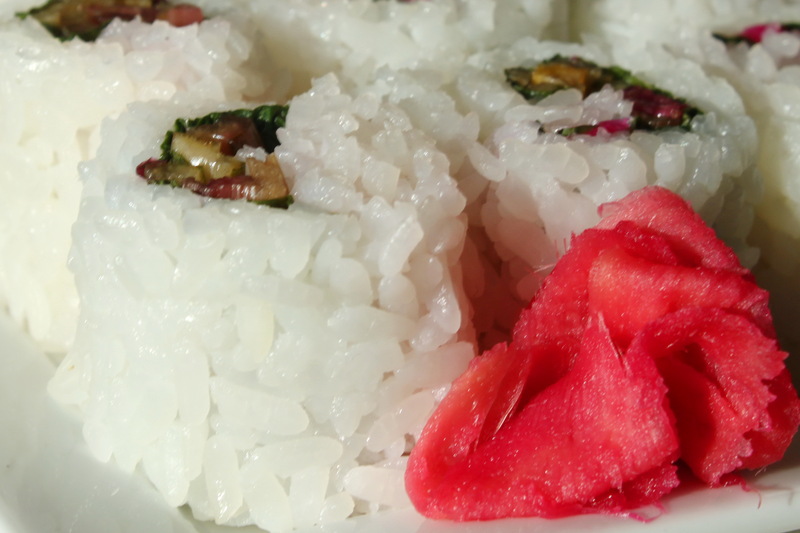 For the sake of simplicity this is really just a recipe for the chard “filling” and condiment “ginger” I am going to assume you know or can source how to prepare sushi rice, roll sushi and prepare wasabi. Sushi directions are often on the back of the sushi rice bag anyways. 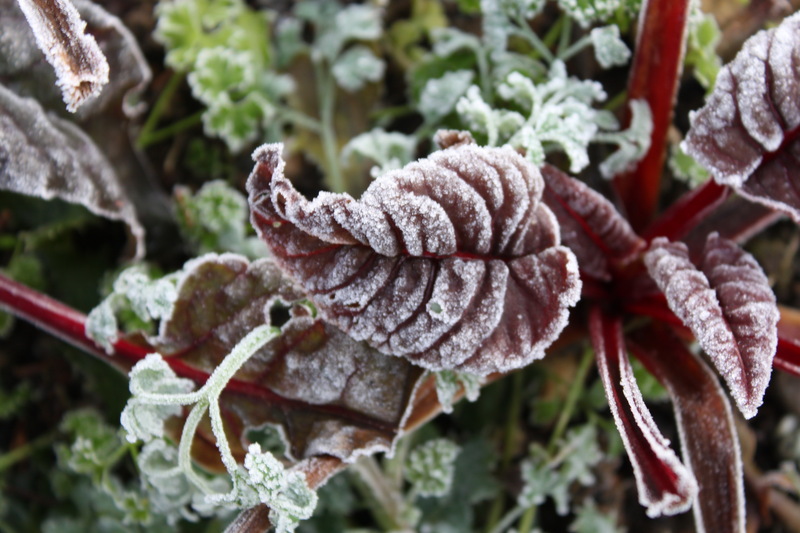 In the photo I used blanched deveined chard leaves in place of the nori seaweed. 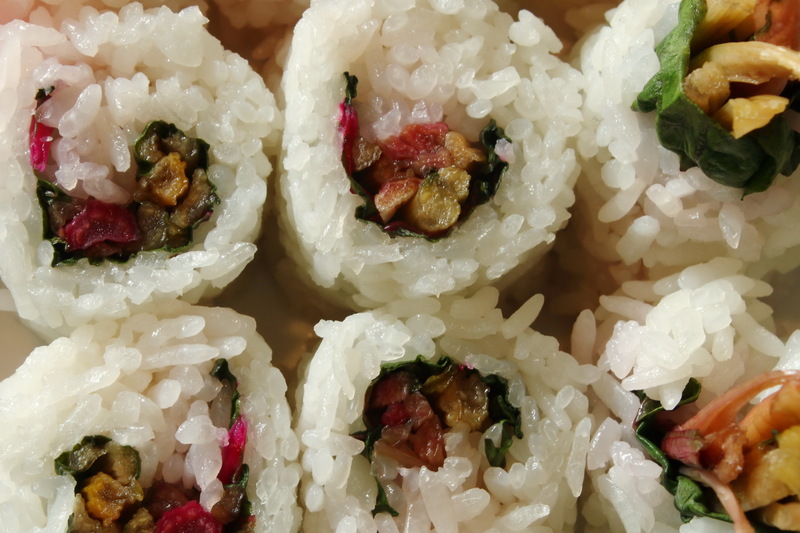 Chard worked well to hold the rolls together, if you don’t like or cook for someone who doesn’t like seaweed, chard makes an excellent substitute in rolled sushi, it’s tough enough to hold together but flexible enough to roll and cut easily. The second batch I did (not pictured here) was done with good old nori I actually preferred the second batch taste wise but I also happen to love seaweed. Method: Slice out the chard stems from the chard leaves, sort by colour, chop into matchsticks, keep the colour groups away from each other so they don’t get mucked up. 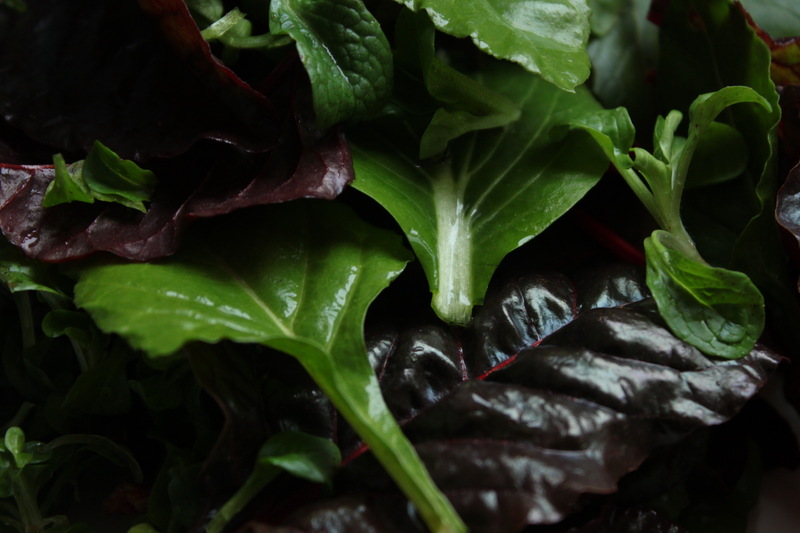 Place each colour group of chard stems into a bowl. To make the pickle solution simmer together in a sauce pan equal parts white rice vinegar and white sugar, heat/stir until sugar dissolves. Pour enough pickle solution over each group of chard stems just to cover them, (set aside some pickle solution for the ginger) seal in an air tight container and let rest over night in the fridge. Once you have used your chard stems, if you are feeling like doing more sushi you can use the colourful left over chard pickle solution instead of seasoned vinegar for cooking sushi rice and create colourful sushi rice too. Method: Mandolin or very thinly slice peeled fresh ginger root, the big plump young ginger tubers are the best for pickling if you can find them. Place in an container, pour enough pickle solution over ginger just to cover it add a small slice of beet for colouring, seal up and let rest in the fridge over night. If you don’t want lovely pink ginger omit the beet slice, homemade natural looking ginger tastes just as good. It just doesn’t seem right to celebrate when it has been such an incredibly warm winter, I have had greens available in the garden all winter long, minus the couple days of snow we have had of course. Right now I am admiring all sorts of colourful chards that have overwintered just fine without any form of cloches or protection, there is tons of curly parsley, cilantro, perpetual spinach and of course a tightly woven carpet of self sown mache. There are a few scraggly collards out there, baby sorrel is making an appearance and the first micro arugulas are coming up everywhere. Legitimate cold weather greens are tougher, thicker, hardier,sometimes bitter and not necessarily as pretty to look at with their tattered frost bitten edges but typically they are a scarce delicacy at this time of year, if it was just another average cold winter I would be dying for anything fresh out of the garden by now. This year I have been so spoiled to the point of overrun with winter greens, I shouldn’t complain but I will admit to buying a bag or two of watery tasteless “spring greens” just to use as a diluting agent for my cold weather salads! Are all gardeners obsessed with eating green tomatoes? I didn’t understand why anyone would try and make unripe fruit edible in the first place but in recent years I too have become obsessed. There is something so wrong about carefully tending and nurturing tomato plants all season only to let all those precious, yet unripe, jewels of the garden go to waste. I am not a fan of green tomato chutney, relish or jam it’s all too sugary for me. Pickled green tomatoes almost worked for me but it’s still something that is going to require altering before I attempt it again. Fried green tomatoes yes of course but really battering and deep frying anything tastes good. It comes down to this; green tomatoes are not palatable fresh on their own, they require transformation. Enter the slow roasting phenomenon and green tomatoes that are soft, tart almost citrusy with a hint of sweetness. I have tried roasting green tomatoes in the past which was literally, bitterly disappointing. Faster roasting works fine for ripe red tomatoes but don’t try to cheat this recipe by increasing the temperature and reducing the cook time it simply does not work and the already unripe acidic fruits quickly become bitter, they really need the longer roasting time to develop some sweetness. These are the last of this year’s tomatoes, the ones that didn’t ripen in a brown paper bag on the counter, a much nicer way to end my tomato season, rather than tossing them in the compost. Preheat oven to 300F. Wash, dry then slice tomatoes in half, spread in a single layer on a cookie sheet cut side up. Brush cut side with olive oil liberally and sprinkle with fine ground sea salt. Bake for 3 to 4 hours until most of the liquid has evaporated and tomatoes have shriveled up they should look a lot of like sundried tomatoes. This is the first time I have saved dried favas from the garden for cooking, I am still experimenting! Aside from removing fava beans from their pods they also have a secondary casing skin on each individual bean. The casing skin is edible it’s just very tough and doesn’t taste very good. 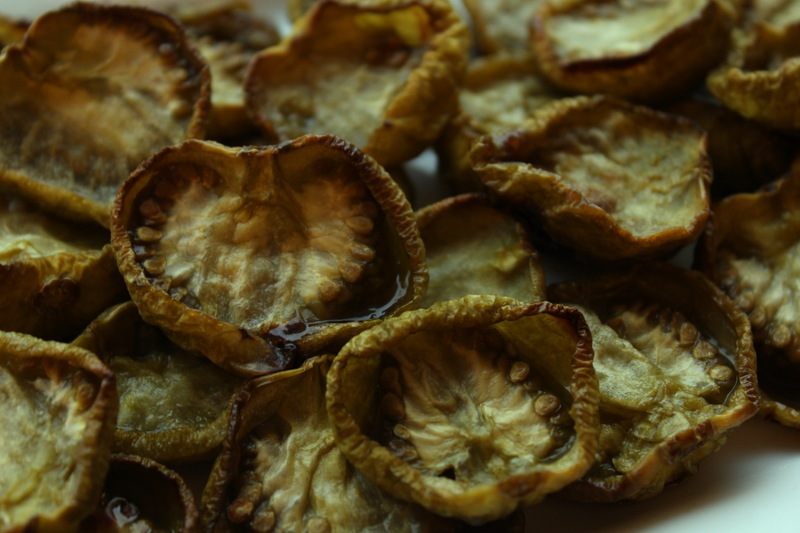 For this recipe I tried leaving the skins on, the texture was indistinguishable against the coarseness of the olives and picked up their salty flavor seamlessly. Method: If you’re using fava beans from the garden rise and sort carefully I was shocked at how dirty my beans were. Cook beans by boiling them for about an hour until they are tender, you can leave the skins on for this recipe, once cooked rinse with cold water and set aside to cool off, then put everything in a food processor, pulse until you get a consistency you like. 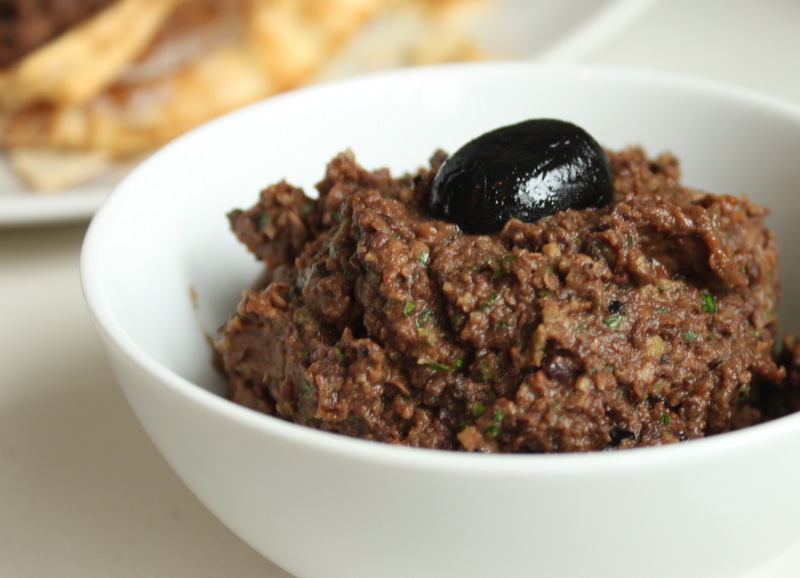 Serve with crispy pita chips, toss with pasta, spread on a pizza or whatever you usually do with regular olive tapenade. Last fall I planted a “large” part of the garden with favas destined not to be consumed but to save for seed. I have never attempted to save bean seed before but unintentionally I think I have done it right. I got entirely swamped with work this summer and have done literally nothing out in the garden until yesterday, anything that happened to be there was either planted in the spring(or earlier) or grew itself. The fava patch was quite spectacular standing over four feet tall at its highest point, my son being just exactly 48”s enjoyed hiding amongst the stalks like a mini corn maze. 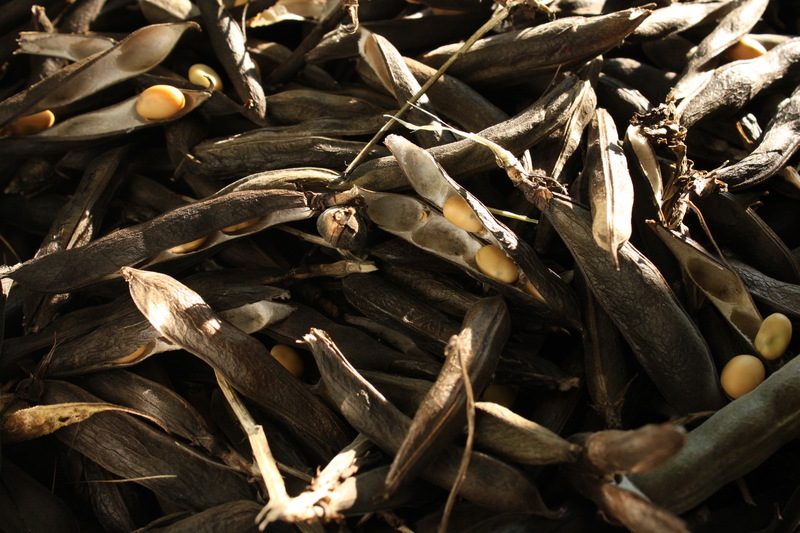 As the summer flew by, one day I looked out the window and realized my seed saving plan was unwittingly unfolding, the pods were drying up on the stalks ready for storage. I have to digress because it was also around this time that something very strange happened it was unreasonably early one morning, still in my pajamas clicking away feverously at my lap top, doing what I do for a living, when there was a knock on the door, it was a lady asking for a bag so she could collect my fava beans! From my garden! I don’t know why people assume because you grow your own that you are some kind of food bank? Honestly I am happy to give away the excess hoards of fresh perennial herbs and salad greens but it always seems the beggars are the choosers, cleaning out the front yard berries, baby zucchinis and onions when my watchful eye is not there to protect them. The early morning door knocker was just a bit too much for me, she trampled my chives, oregano and sage, despite the fact my yard is fully fenced and gated. The whole incident really troubled me. I have yet to come up with a solution for the rogue urban home stead grazers, except that I had considered growing more hard to recognize foods in the front yard? But that’s all beside the point for now, even after said individual left the garden gate wide open as she left with as many fava beans as she could carry, I still have more than enough seed beans. I can’t imagine trying to grow or save enough favas to last all winter, it took me over 3 hours to harvest and shell just 2 kilos of dried fava beans. I originally felt wrong about paying 12$ per kilo at WCS for favas but considering all that saved work it’s not that bad? Oh well, it was super enjoyable to get out in the sun and pick beans! My approximate yield was about 10 to 15 pods per plant and it took about 60 pods to yield one cup of shelled beans for cooking, which I haven’t tried yet but I am looking forward to. Now for the really big question are they going to grow this fall? Just have to wait and see on that one. Really Canada day long weekend(happy Canada day by the way!) 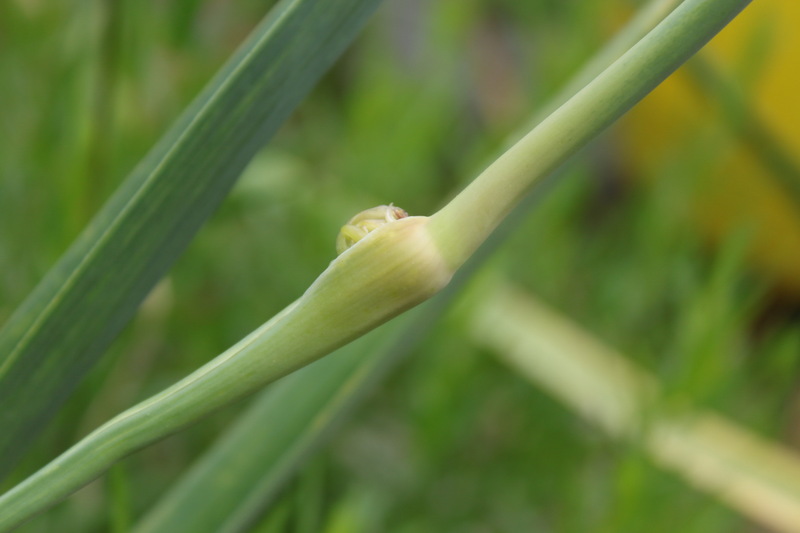 is a bit late to be cutting garlic scapes they would have been ten times tastier a couple weeks ago. 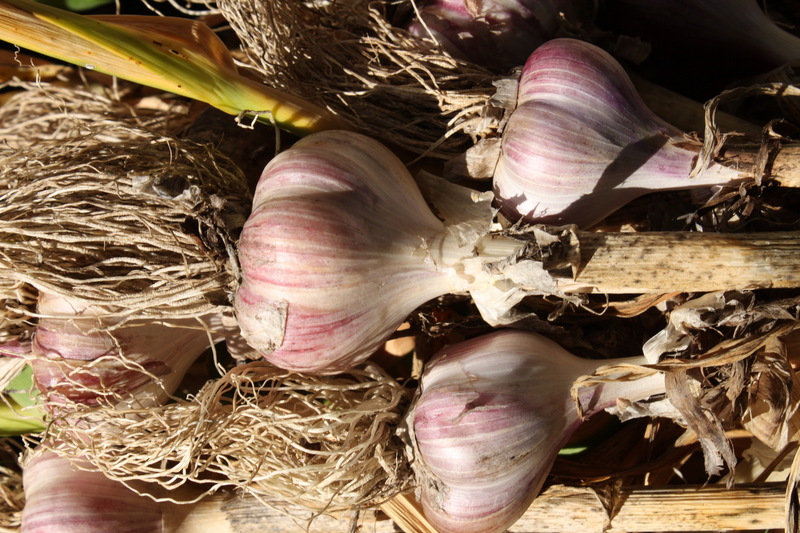 Some of the garlic flowers are bursting at the seams, once they open I will have officially missed my chance, it’s literally this weekend or never. 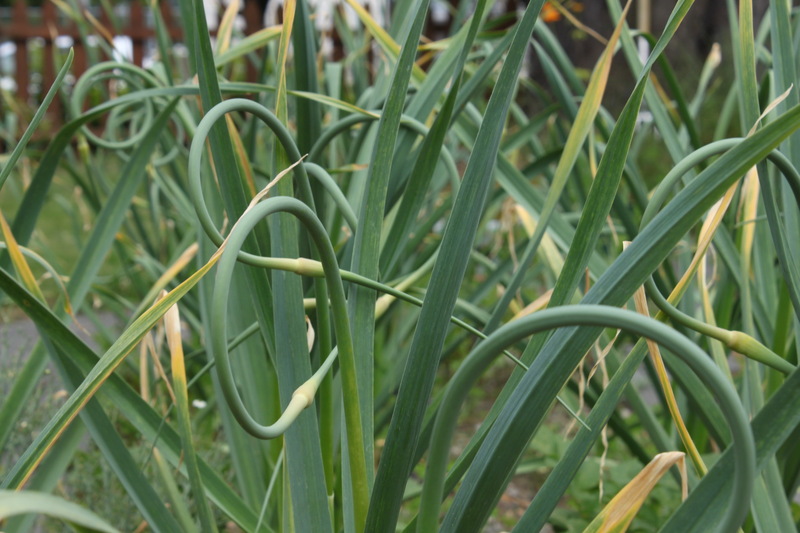 Young garlic scapes are much more tender and succulent, as they age, they turn into a legitimate stem not great for eating. I should have clipped all these scapes as soon as I saw them crop up but shopping in a grocery store all my life has given me a false sense of food security. Produce sections feature fresh ripe produce on demand, in reality food plants produce their harvestable parts in a very short window of time. In just a day or two I have completely missed harvests, greens bold, brassicas bloom, asparagus’ fern, there is no messing around coming up with a meal plan. Such is exactly what happened to my garlic scapes, I saw them come up and failed to realize the fleetness of their nature, old habits die hard and I was once again reminded that this is not a grocery store, this is real life. In my defense I have been working a lot and I think remaining relatively garlic free in a sales job is a legitimate expectation, cutting garlic scapes is any reasonable volume is a messy garlicky task and I still haven’t gotten the smell off my hands.